This cleverly designed and beautifully crafted wooden play farm set is a 3 in 1 toy. 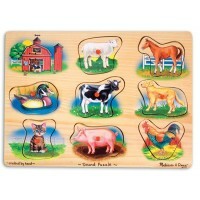 Designed by French toy maker Vilac, the farm is also a shape sorter and a shape matching puzzle. In the roof of the farm house there are 4 shape spaces to match the animals to. On the side and back there are 4 openings so that the farm house can be used as a shape sorter. On the other side of the farm house there is a barn door to let the animals in and out through. The farm house and the animals are all painted in bright, vivid colours which makes it appealing to both boys and girls. 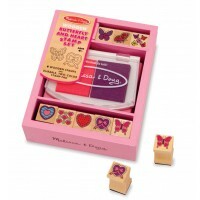 A fun and educational toy that will keep little ones entertained for hours on end.